Last night, the City of Urbana and Urbana Business Association hosted a ribbon cutting for myself, Norden, Urbana Land Arts, and Hands On! All four of our businesses are currently located in [co][lab], a co-working office space in Downtown Urbana. It was an amazing opportunity to be surrounded by city officials, local organizations, friends, and community. The ribbon cutting was a milestone for all of our businesses. For me, it represents a significant step in an unexpected journey. I started off going to school to be a bioengineer, made a switch to religious studies, and after graduating ended up moving to Grove City, PA to start a non-profit. While these experiences don't all seem to be connected (at least they aren't yet fully apparent to me), they all have played a part in helping me create a business that is dedicated to serving my community, telling the stories of local businesses & entrepreneurs, and using social media in innovative and socially conscious ways. I'm really happy to be in [co][lab] because it helps me pursue these goals, and I look forward to being part of dynamic, collaborative community who is passionate about doing good business and being part of the revitalization process of Downtown Urbana. 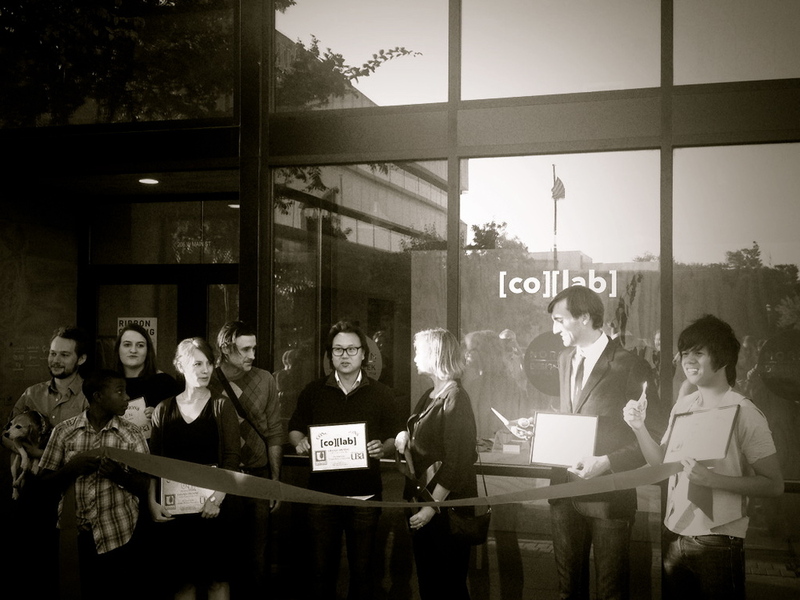 After the ribbon cutting, the doors were opened for the community to check out [co][lab] and see what the space is all about. The [co][lab] open house also had spillover into the adjoining Cafeteria & Company, a local food collective housing new restaurants Pizza M & Flying Machine Coffee. They also had their ribbon cutting earlier in the day. So all around, it was a big day for new businesses who have made their home in Downtown Urbana. Missed the open house? No worries, there will be ample opportunities to check out [co][lab] at upcoming events, or stop by co-work Tuesdays - an opportunity for community members to co-work at [co][lab] every Tuesday from noon to 5pm! For a full calendar of events, check out [co][lab]'s website.